Islamic State militants clashed with Syrian troops within two kilometers of ancient Palmyra, the Syrian Observatory for Human Rights reported on Thursday. There’s a risk they will run rampant over the landmark UNESCO site. “ISIS terrorists infiltrated al-Sikhneh and many regions in east Palmyra where units of the army clashed with them and foiled their attacks from many directions,” Homs governor Talal Barazi told the SANA news agency. Having defeated government forces in fierce fighting that took the lives of 110 combatants, the militants appeared to be just within walking distance of the ruins, according to the monitoring group. There are fears they will cause similar destruction to that wreaked in Iraq earlier in the year. "Palmyra is under threat," warned Rami Abdel Rahman, the Observatory director. "IS has taken all the army posts between Al-Sukhnah and Palmyra," moving from its stronghold in the Euphrates valley to the east, he added. The remains of the ancient caravan city of Palmyra stand in the middle of the desolate Tadmorean Desert in Syria. UNESCO describes Palmyra as a landmark of "outstanding universal value," an "oasis in the Syrian desert" northeast of Damascus. 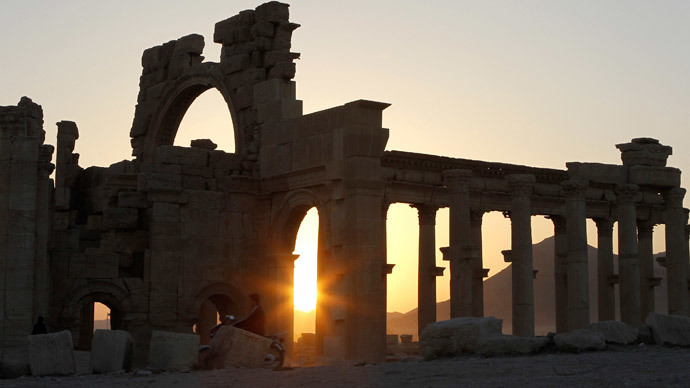 Palmyra harbors the ruins of a great city that was once one of the world's key cultural hubs. Syria's director of antiquities, Maamoun Abdulkarim, said he had no doubt that if Palmyra fell into the jihadists hands, it would suffer a similar fate to ancient Nimrud in Iraq, which they laid to waste earlier this year. "If IS enters Palmyra, it will spell its destruction," Abdulkarim told AFP. "If the ancient city falls, it will be an international catastrophe. Local governor Barazi said the adjacent modern town of Tadmur was sheltering 1,800 families who had fled Al-Sukhnah when it fell to IS on Wednesday. A SANA reporter in Palmyra quoted local sources as saying that IS militants had perpetrated crimes against the families there, burning and looting homes. According to the Observatory, both sides suffered heavy losses. The clashes resulted in the death of at least 70 government troops, including six officers. The Islamic State lost 40 men, including two commanders, one of them the leader of the offensive. Last month a seven-minute video emerged, showing IS militants destroying the historic Assyrian city of Nimrud, which dates back to the 13th century B.C. The ancient site is near the Islamic State-controlled city of Mosul in northern Iraq. It showed the militants drilling away at sculptures believed to be some 3,000 years old. "I condemn this mad, destructive act that accentuates the horror of the situation. It confirms that the terrorists are not only destroying representations of figures and bas-reliefs," the UN cultural agency's chief, Irina Bokova, said in a statement. “With their hammers and explosives they are also obliterating the site itself, clearly determined to wipe out all traces of the history of Iraq’s people,” she added. The jihadists previously pronounced that they deem the artifacts idolatry. The militants, who have created a self-proclaimed caliphate in northern Iraq and parts of Syria, have been waging a campaign to obliterate cultural sites and relics, which fail to fall in line with their ideology. Another video, released in April, showed IS fighters destroying the 2,000-year-old ruins in the ancient city of Hatra in northern Iraq, 110 kilometers south of Mosul. In February, the jihadists obliterated ancient artifacts in the Mosul Museum and blew up the Mosul Public Library using homemade bombs. IS militants burned a huge number of books in Mosul’s Central Library, sparing only Islamic publications.